I love silent film. I’m not a huge fan of movies per se, but I do love film. I have seen one several times which I would like t o recommend for you. It is F.W. 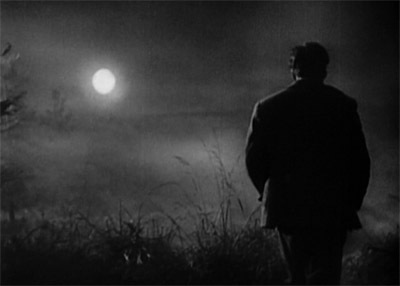 Murnau’s Sunrise: A Song of Two Humans. 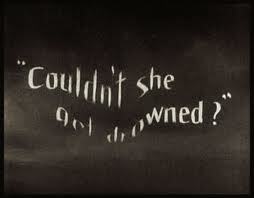 This is a silent film from 1927 with a great score. It’s the only film I know in which an entire category was invented so it could win an Oscar that year. It’s an Expressionist film, but it’s not Cabinet of Dr. Caligari Expressionism, even though the characters are named The Man, The Wife, The Woman from the City, and they hail from places like The Farm and City. Very fundamental. But the use of light and shadow, and Murnau’s interest in light as a character in the film, is fantastic. Murnau also directed the original Nosferatu, another silent film you should definitely watch should you get the chance. But back to Sunrise. Of course, the woman from the city is a typical man-eating Vamp who smokes cigarettes and likes showing the outline of her legs through her black dress. She has mesmerized The Man and while they are making love on the shore of the water by moonlight she talks him into drowning his wife and making it look like an accident. He is tormented. We see scenes of him wrestling with his conscience as ghostly images of The Woman from the City embraces and kisses him. He decides to go through with the murder. Everything in this film works, even, I suspect, quite by accident. In one scene, as The Man and The Wife are in a boat headed across the water and come to tie up at a pier, we see a black swirl of water behind her. It’s a spooky metaphor for the danger she’s in, and I’m quite certain it’s real and not a special effect. Janet Gaynor plays The Wife. Rarely have I ever seen anyone as fragile and innately vulnerable as she appears on screen. She is perfect for the role, as is Margaret Livingston who plays the Vamp. I don’t want to say much else about the plot. I don’t want to spoil it for you. But the search on the water by lamplight (an incredible achievement considering the technology back then) has been copied in a ton of films since. And for good reason: it’s freaking AWESOME. The play of light on water, the light and shadow on the faces…Wow. I highly recommend this film. As a writer this film also fascinates me because the story is simple, but Murnau brings layers of complexity to it. If you ever get the chance I urge you to see it. You may find your outlook on life changes a little. It’s that good, and that powerful.